Flexbar’s Metrology Grade Replication Materials have been used by a wide range of manufacturing and service industries for over 40 years. Flexbar first developed its FACSIMILE Measure Image “Hard Copy” Quick Setting Plastic Compound to accurately reproduce a wide range of internal, external and surface finish geometries. This method has become very popular for checking forms for non-destructive inspection and measuring hard to access part dimensions. In the early 1980’s Flexbar developed and introduced its Reprorubber Metrology Grade Self Curing Casting Materials, also providing virtually perfect replica castings of both internal and external forms. 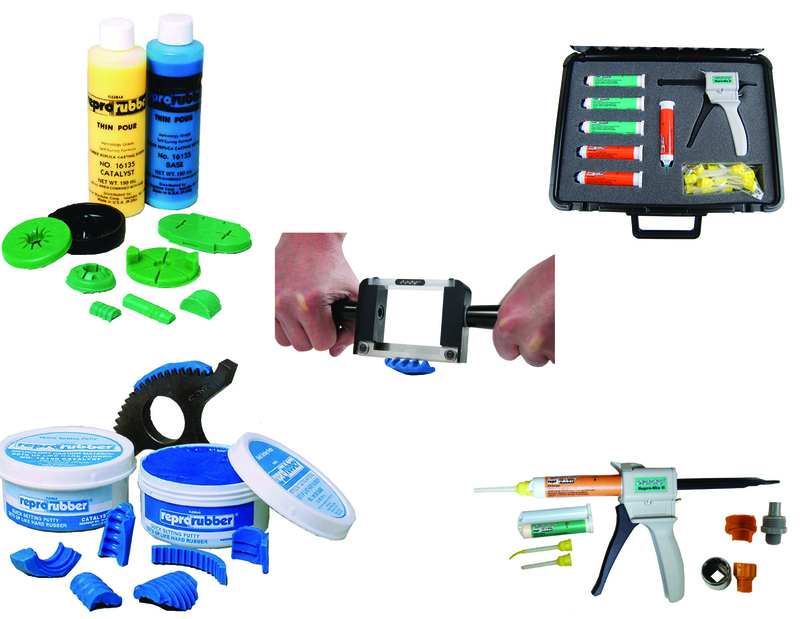 Supplied in 3 different viscosities, these easy to use kits produce quick “Zero Shrinkage” reproductions in less than 10 minutes and do not require a release agent of any kind in most applications. The 3 available Reprorubber viscosities include Reprorubber Thin Pour, Reprorubber Medium Body Orange and Reprorubber Putty. Each version consists of an easy to mix two-part base/catalyst system which produces rubber-like replica castings ranging from 30 to 50 durometer on the Shore A-2 scale . The Thin Pour Green viscosity is ideal for internal forms requiring superior flow and detail. The Medium Body Orange and Quick Setting Putty viscosities can be used for both internal and external applications such gears, threads and grooves and more. In 2007 Flexbar introduced its new Repro-Mix II Quick Dispense Cartridge System for both Reprorubber Thin Pour and Reprorubber Orange grades. Utilizing a reusable dual barrel dispensing gun, the system works with disposable prefilled Reprorubber Cartridges in both Thin Pour and Orange viscosities. Disposable helix mixing nozzles can be used for each application making the system waste-free and convenient to use. Reprorubber® is now commonly used in a diverse cross-section of manufacturing industries including metalworking, automotive and aerospace, oil and gas, medical device, injection molded plastics, sheet metal and stampings and more. The product in all of its forms has become an important tool for today’s increasing demands for inspection and measurement as well as design and manufacturing processes.